What happens when a Yugo falls 170 feet into water. 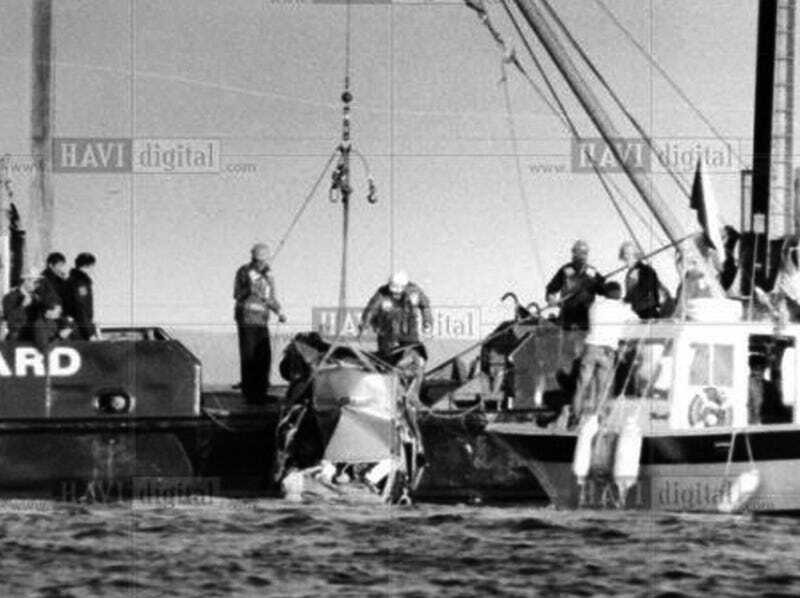 In 1989, Leslie Ann Pluhar’s out of control Yugo crashed off the Mackinac bridge, falling 170 or so feet into the water below. It is popularly believed that the Yugo was blown over the guard rail of the bridge, but this would have been physically impossible. Witnesses saw Leslie’s car swerve left, up onto the median, then swerve right. The Yugo jumped the curb and was launched onto the 3 foot high guard rail. The car continued down the guard rail for about 40 feet according to witnesses, until it hit a suspension cable which sent the car over the rail and into the water below. It took several days to locate the Yugo, which was found under 150 feet of water, and had to be cut apart to extricate Pluhar’s body. Leslie’s family sued everybody. Even Yugo America. Their lawyer claimed wind blew the Yugo out of control, causing it to crash off the bridge. But he never claimed the wind itself blew the car over the railing and off the bridge. Evidence shows the car hit the curb rail nearly perpendicular, and the guard rail did not show 40' of damage. Essentially, when the car swerved back to the right it hit the curb almost dead on, launching it up and onto the guard rail. The bridge was not up to code, the curbs were not high enough. The state of Michigan settled out of court. I don’t know if Yugo America ever actually ended up in court, as the company was on the brink of bankruptcy at the end of 1989 and would in fact be filing for chapter 11 protection before the end of the year. I just finished reading Jason Vuic’s book The Yugo, which dedicates a few paragraphs to this unusual accident. I had heard the urban legend, that the Yugo was the only car light enough to be blown off the bridge, but discounted it because the Yugo is surprisingly heavy for its small size, and no other lighter cars have ever been blown off the bridge. Unfortunately for Leslie it seems the freakish accident was the result of speeding, crosswinds, over-correction, and a deficiency in curb height that ramped the car up onto the guard rail, instead of keeping it in the lane. Had any one of those conditions not been present that day, it’s likely nothing would have happened. Strangely enough, the deficient curb height, a possible reason the state settled, rather than fight it out, has never been changed. Only one other car has been driven off the bridge, in what was ruled a deliberate suicide.